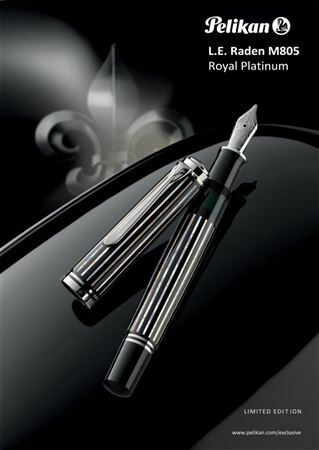 Order your Pelikan Limited Edition M805 Raden Royal Platinum Fountain Pen - M nib today from FahrneysPens.com. Fine Pens, Refills & Luxurious Gifts – great prices & fast shipping. By working with small stripes of precious shell material, the artist of the Raden pen creates a beautiful, impressive piece of art. Each pen is truly unique. The first step to create the fountain pen Raden M805 Royal Platinum is to give the surface a deep black impression by using the special Japanese Urushi lacquer. Then the typical stripes are made with particles from the precious white mother of pearl shell. A platinum foil is carefully affixed one by one to the backside of the stripes. In the next step, the stripes are fixed to the cap and barrel by a coating of laquer. Finally, the artist individually signs and numbers each fountain pen with the Maki-e technique, which used to be reserved exclusively for Japanese Royals as an indication of their power. 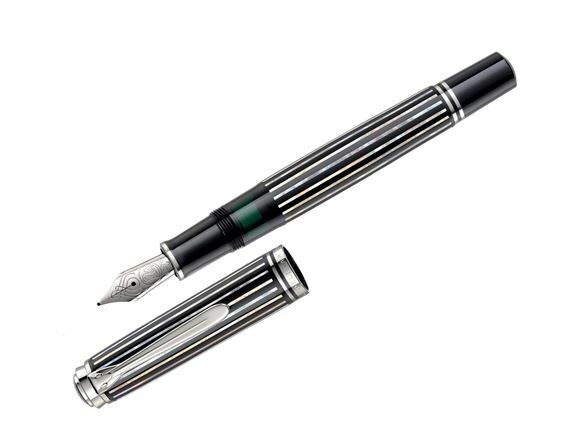 With the limited edition Raden series, Pelikan applies this wonderful Japanese decorative craft to fountain pen models of its famous Souverän® series. The Raden M805 Royal Platinum fountain pens are pieces of art with finely-chased and completely rhodanized 18 carat gold nib in the size M. Each fountain pen is encased in a traditional Japanese gift box which is made of Paulownia wood. The Raden M805 Royal Platinum is a limited edition of 388 pieces worldwide. Bottle fill only. "Prices are competive and order was very simple. Free shipping was a plus." - Verified Buyer, Mar '19"